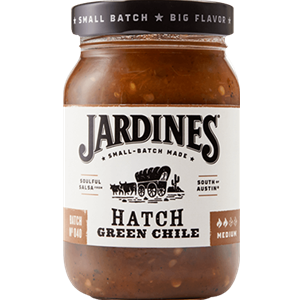 Jardines blend Hatch, New Mexico’s famous green chile peppers with other pepper varieties, onions and spices for spicy, versatile flavor. Tomatoes, Tomato Juice, water, Hatch Green Chiles, Fresh Jalapenos, Dark Roasted Tomatoes, Fresh Yellow Onions, Salt, Green Chiles, Lime Concentrate, Cilantro, Fresh Garlic, Potato Starch, Granulated Garlic, Soybean Oil, Contains 2% or less of: Crushed Red Pepper Flakes, Citric Acid. I am a salsa fanatic and this is the best salsa I've ever had!